The perfect addition to any event… A professional Outdoor Firework Display by Coney Fair Amusements. We pride ourselves on producing high impact, exceptionally high content, custom designed fireworks displays with a commitment to our clients to bring the very finest of pyrotechnic artistry and professionalism to your event. 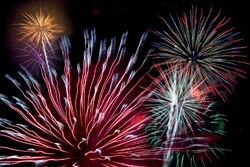 All fireworks displays available to suit your budget and carried out by licensed staff. Fireworks are a great addition to your School Fete, Council Event, Sporting Breakup, Christmas Party, Wedding or Corporate Function. Everyone loves the colours and designs of a Firework display. Coney Fair Amusements make it so easy because we come and set it all up for you so you your staff or family and friends can enjoy a spectacular Fireworks display. Definition of Fireworks – A device that is designed to be burned or ignited in order to yield a visible and/or audio effect. There are many different types of Fireworks Gold Coast – Coney Fair Amusements work with an assortment – A collection of fireworks items, generally consisting of fountains, sparklers, rockets, and firecrackers.